Read this fact sheet in PDF. Fortune 500 corporations collectively have stashed $2.5 trillion in profits offshore, on which they have avoided up to $718 billion in taxes. It’s no wonder that policymakers on both sides of the aisle are weighing legislative options to either tax these profits or create an incentive for corporations to “repatriate” or bring these profits to the United States so that they are subject to taxation. Lawmakers have introduced several “repatriation” proposals that would glean tax revenue from these offshore profits. But the only solution that will ensure corporations pay taxes on their offshore profits AND shut down the practice of stashing cash offshore is to end deferral, the tax code loophole that allows corporations to indefinitely avoid paying taxes on profits stashed offshore. 1. Repatriation holiday: Allows corporations to voluntarily repatriate earnings to the U.S. at a reduced tax rate for a limited time. 2. 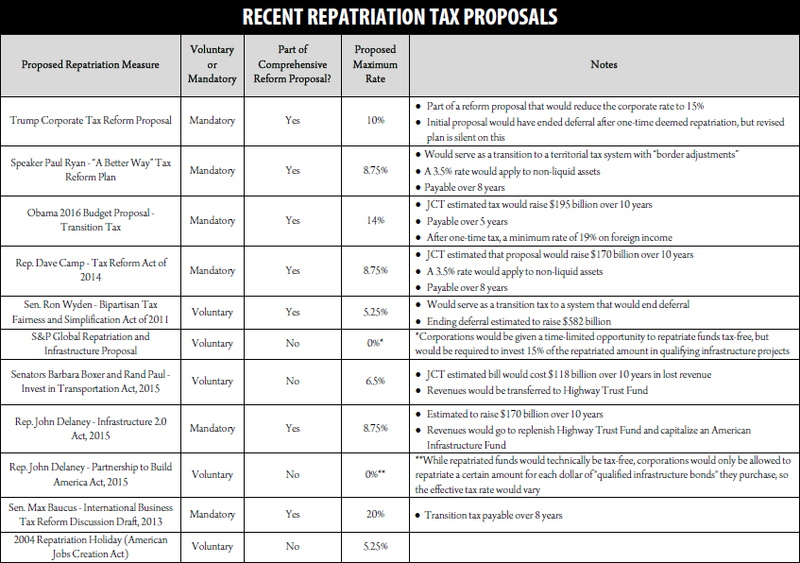 Deemed repatriation: Levies a mandatory one-time tax on accumulated foreign profits. Existing proposals would do this at a reduced rate. • A repatriation holiday creates incentives for companies to continue shifting their profits into tax havens in anticipation of another tax break in the future. In fact, this is what happened after the 2004 repatriation holiday. • While repatriation holidays are touted as a way to spur investment in domestic capital or job creation, the history of the 2004 repatriation holiday reveals that repatriated earnings will instead be spent on issuing shareholder dividends and stock buybacks. • Both types of proposals would raise revenue in the short run but may lead to a long-run revenue loss since corporate earnings would be taxed at preferential rates. • Both types of proposals reward companies that have engaged in aggressive tax avoidance. Since U.S. tax liability is reduced by foreign tax credits, companies that have shifted more of their earnings into tax havens (and paid little to no foreign tax) receive a larger tax break from the rate reduction than those with profits in higher-tax jurisdictions. The most straightforward way to address the offshoring of corporate profits is to no longer allow U.S. multinationals to defer taxes on the profits they hold in their foreign subsidiaries. Instead, all income of U.S. companies would be taxed when it is earned, regardless of the location. This removes the incentive for companies to artificially book earnings in tax havens through tactics such as transfer pricing and earnings stripping. A transition to a system without deferral would also need to implement a one-time tax (preferably at the full 35 percent rate) on the accumulated offshore profits.